Fell-Fracasso’s shifting, painterly surfaces and Adamik’s luminous glass and ceramic pieces have a material dialogue. Her ceramic shapes reference essential architectural forms: the archway, the vertical panel, the pillar. She sometimes keeps this armature but shatters the glass linework into fragments that operate as a patterned surface. Soft chalky cerulean blue and faded red deflect suggestions of classicism, offering an unusually harmonic interaction within fractious materials. 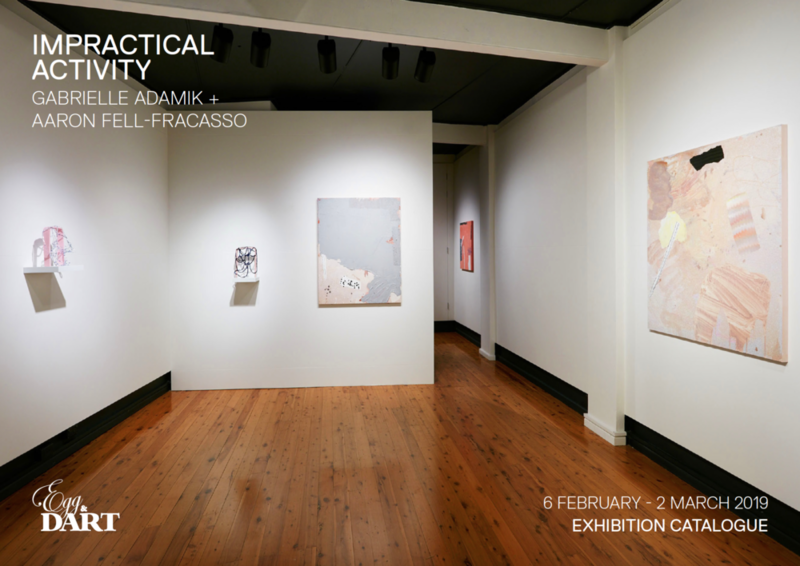 Fell‑Fracasso’s frames present rotating rectangles (similar to Adamik’s ceramic panels) on which gesture and pattern is enacted. He then inverts this – a monolith shape moving like a dust cloud over a scumbled and complex surface, chunky opaque textures over gloss. Muted greys push back on areas of more vivid colour. Transitions in scale occur across the show. This is the beauty of pure abstraction – that it allows the viewer to contemplate at the microscopic, the architectural or the cosmic level. Abstraction offers serious thinking while encouraging visual play. What a joy it is to take a break from the constancy of the readable image. Within this moving ground is the potential for original thought and subtle emotional states. Gabrielle Adamik studied Object Design in Glass at Sydney College of Arts, and has recently been a finalist in the touring Ranamok Glass Prize and the Meroogal Women's Art Prize. She was an Artist in Residence with Gapuwiyak Community, North East Arnhem Land where she explored basket-making using pandanus. Aaron Fell-Fracasso studied Visual Arts at the University of Wollongong. He has extensive experience as a painter and an independent curator. His work has been a finalist in numerous art prizes, recently the Paddington 2018 and is held in the University of Wollongong Collection.